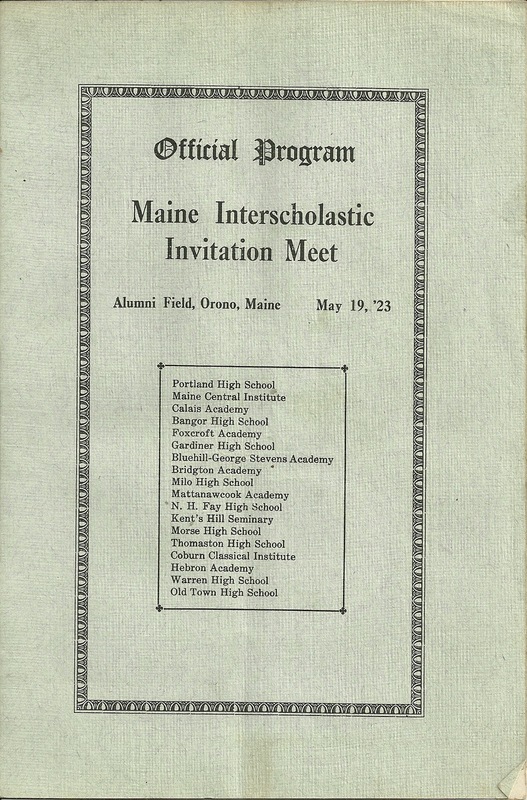 Official Program, Maine Interscholastic Invitation Meet, Alumni Field, Orono, Maine, May 19, 1923. 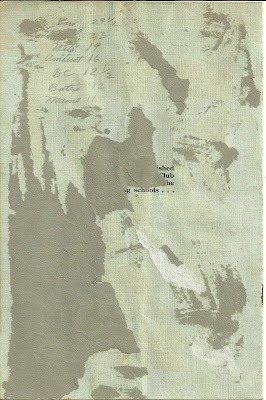 Interesting handwritten notations throughout. Below: Pictured are Coach Flack and Coach Murphy. 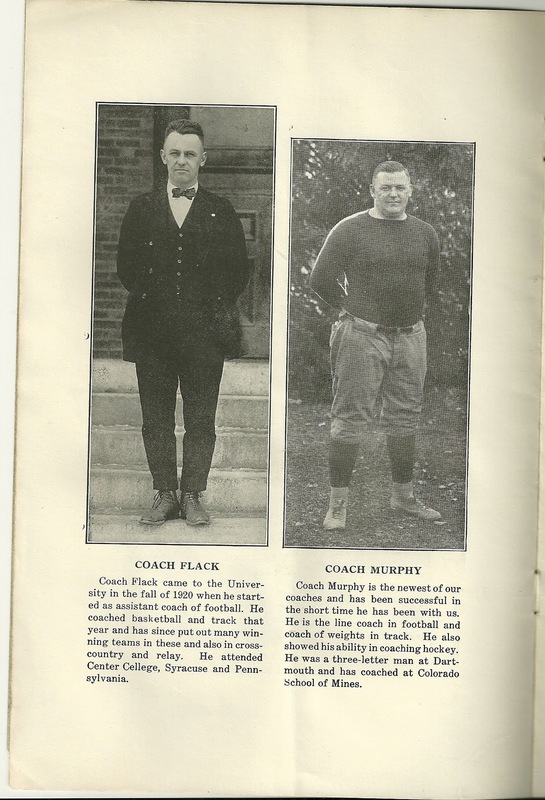 Coach Flack came to the University in the fall of 1920 when he started as assistant coach of football. He coached basketball and track that year and has since put out many winning teams in these and also in cross country and relay. 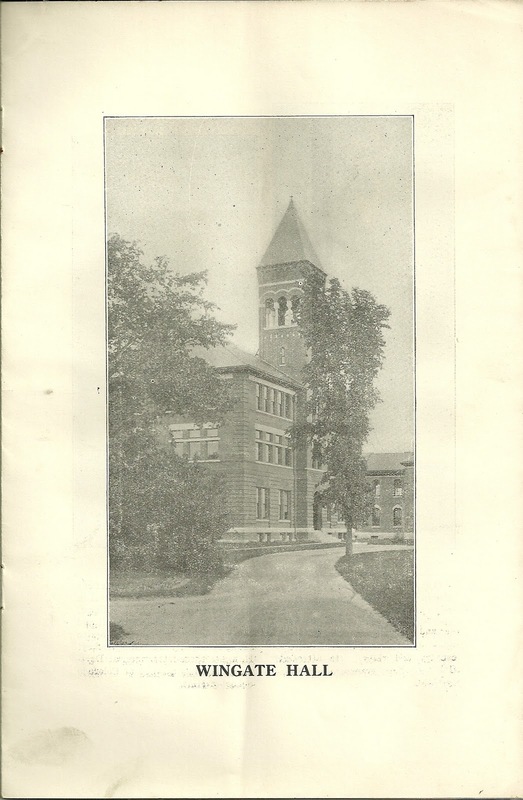 He attended Center College, Syracuse and Pennsylvania. Coach Murpy is the newest of our coaches and has been successful in the short time he has been with us. He is the line coach in football and coach of weights in track. He also showed his ability in coaching hockey. He was a three-letter man at Dartmouth and has coached at Colorado School of Mines. Captain Ned Lawrence. 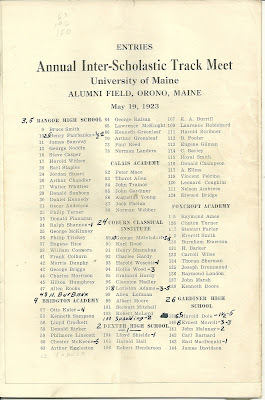 "Ned" is captain of track, wining his letter in his freshman year. He was captain of relay his Junior year. 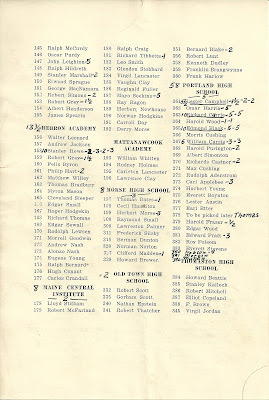 The same year he tied the State record in the 440 yard dash. He is a member of the Senor Skulls and the honorary chemical society. Captain Ed Kneeland. "Ed" was captain of relay, winning his letter in cross-country in his Junior year. He is an active man on the campus. He is a member of the Senior Skulls and the honorary journalistic society. Captain Mac McKeeman. 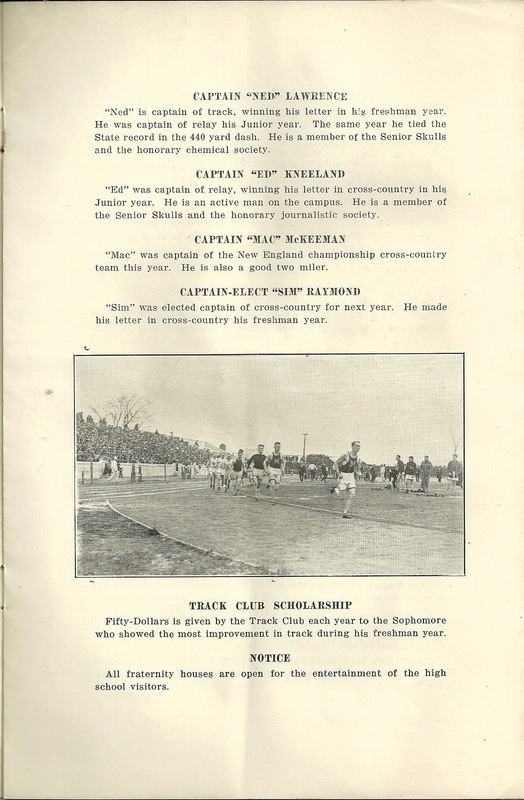 "Mac" was captain of the New England championship cross-country team this year. He is also a good two miler. Captain-Elect Sim Raymond. "Sim" was elected captain of cross-country for next year. He made his letter in cross-country his freshman year. 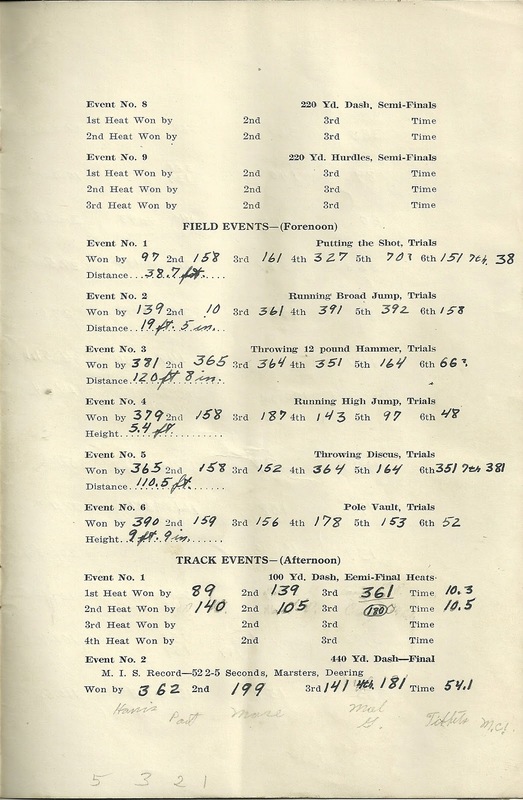 Track has had a successful season this Spring under the leadership of Captain Ned Lawrence '23, the team having made a good showing in all the meets. M.I.T. 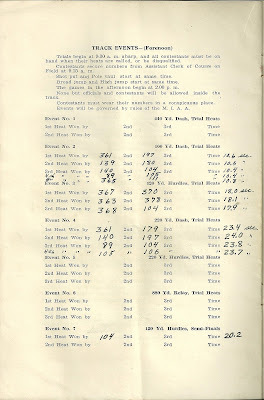 with a strong aggregation succeeded in defeating the blue in a dual meet at Orono, but a week later Brown with a well balanced team fell before the Orono speedsters. 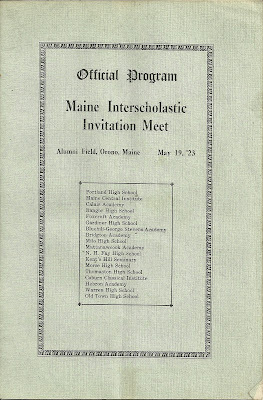 Although Maine was only conceded an even chance in the State meet of winning second place, she easily placed second giving Bowdoin several surprises. "Cuddy" Murphy has been added to the coaching staff, and has found some promising weight men among the Freshmen who will be point winners in the next three years. Coach Flack has labored hard under all sorts of weather conditions, and the results of the meets have been gratifying to him as well as to the student body. 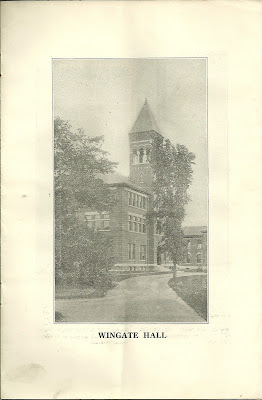 Cross country teams at the University of Maine have long held a prominent place as a varsity sport. 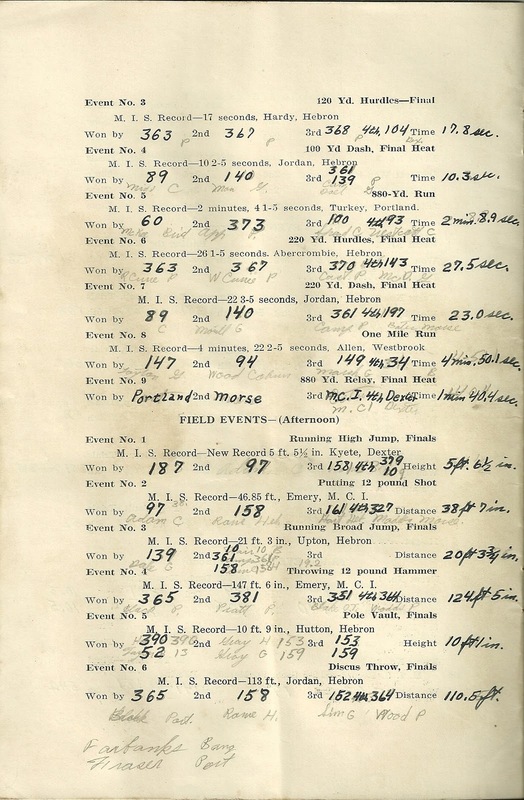 In the history of Maine's Cross Country teams they have won the New England College Championship runs five out of ten times that this event has been held. 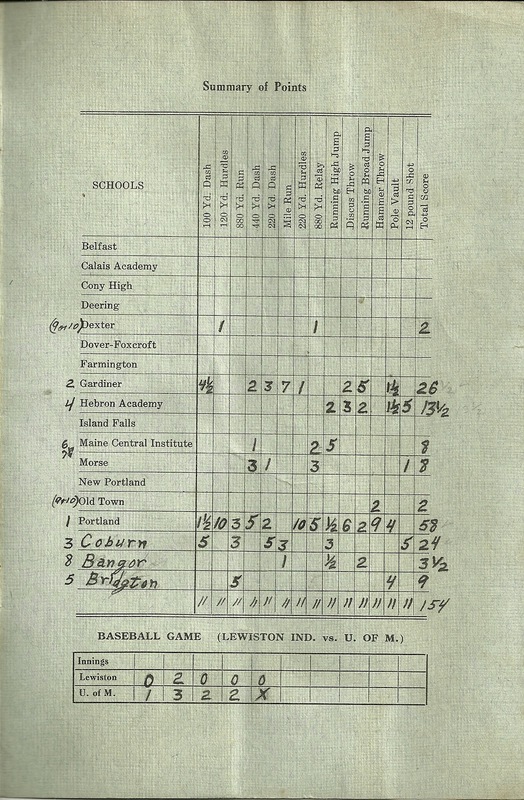 In the National Intercollegiate runs Maine has always placed well up with the larger colleges of the country, while in the State Championship runs Maine has won the event every year except in 1921 and 1922. This past year Maine has had a very successful year. 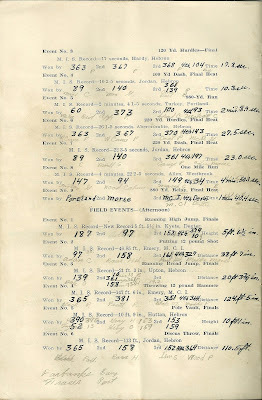 Under the leadership of Clyde A. McKeeman of Calais, Maine, Maine won both the State and New England Championship and placed sixth in the National Intercollegiate run. A new feature has been added to the sport this year by the development of a fast Freshman team which competed in the National Freshman Intercollegiate run at New York. Next season it is hoped that the new freshman class will bring a nucleus of material for this sport, as meets will be held with other colleges. Coach Flack will coach both outfits next fall and under the leadership of Capt. 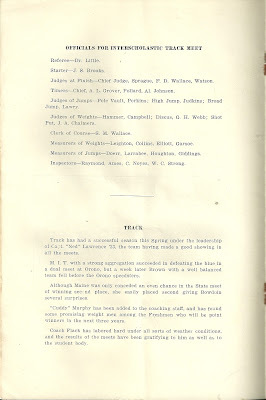 H. W. Raymond of North Jay, Me., Maine will no doubt have another championship team. 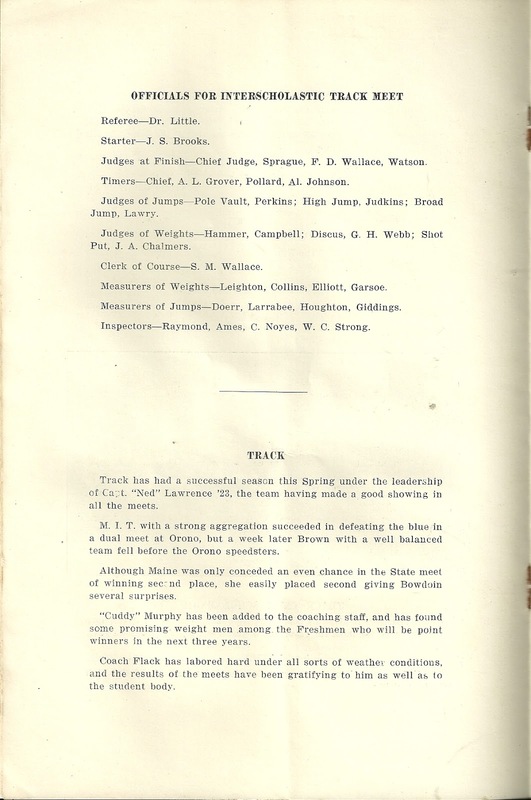 Although a branch of Track, Relay is in itself a separate sport. 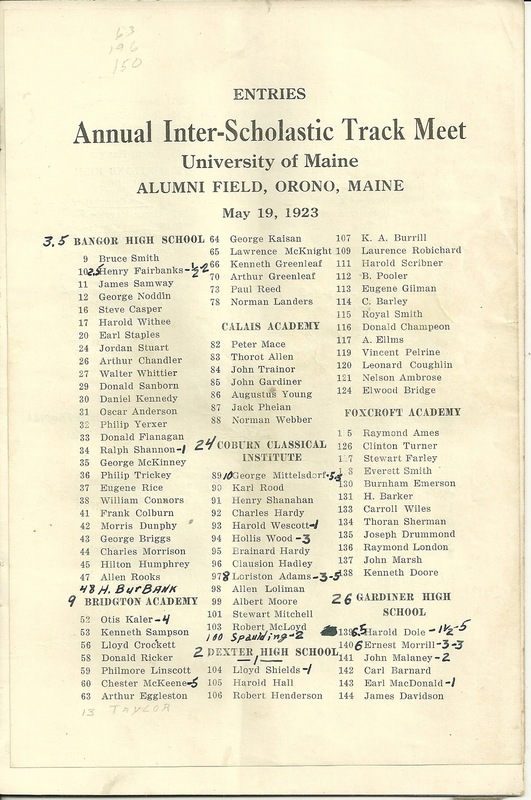 It is of importance not only for its own value but from the fact it keeps in condition any men who may have been out for Cross Country in the Fall, and puts in condition any men who may be desiring to go out for Track in the Spring. 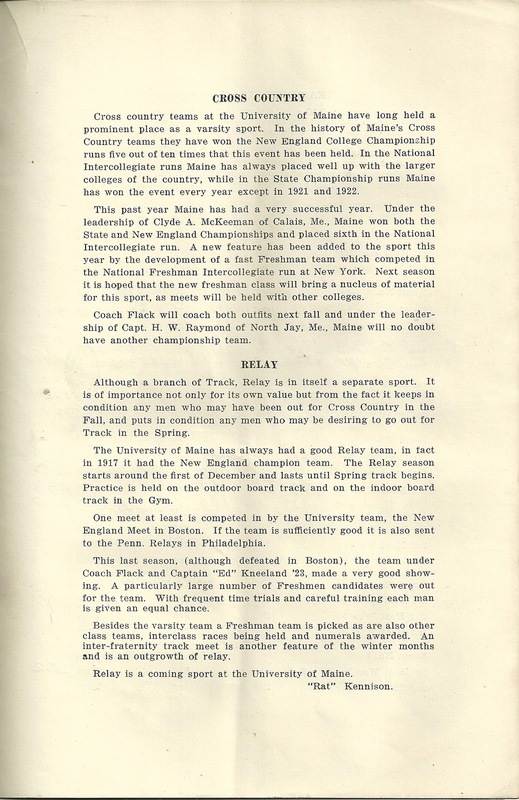 The University of Maine has always had a good Relay team, in fact in 1917, it had the New England champion team. The Relay season starts around the first of December and lasts until Spring track begins. Practice is held on the outdoor board track and on the indoor board track in the Gym. 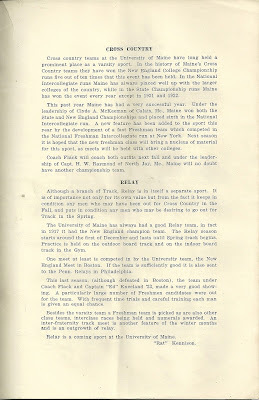 One meet at least is competed in by the University team, the New England Meet in Boston. 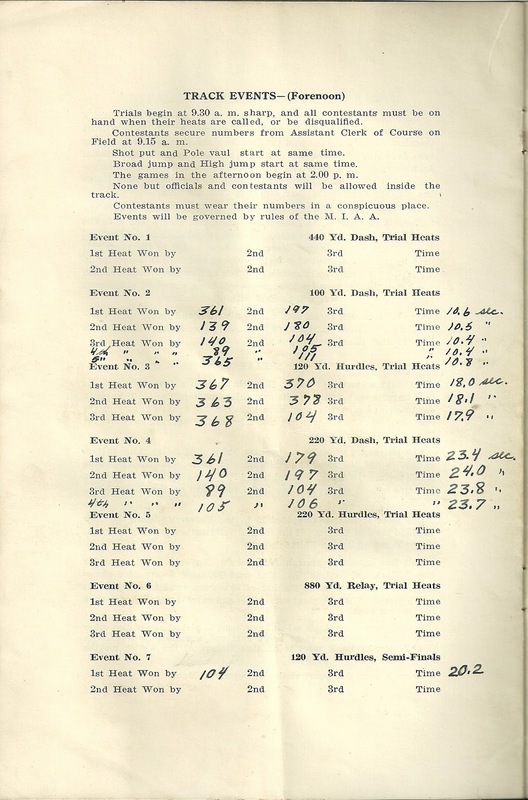 If the team is sufficiently good it is also set to the Penn Relays in Philadelphia. 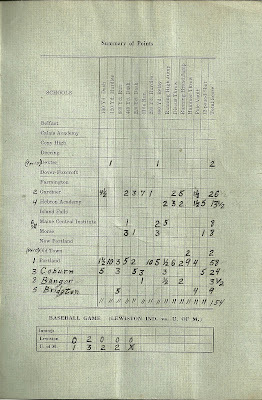 This last season, (although defeated in Boston), the team under Coach Flack and Captain Ed Kneeland '23, made a very good showing. A particularly large number of Freshmen candidates were out for the team. With frequent time trials and careful training each man is given an equal chance. 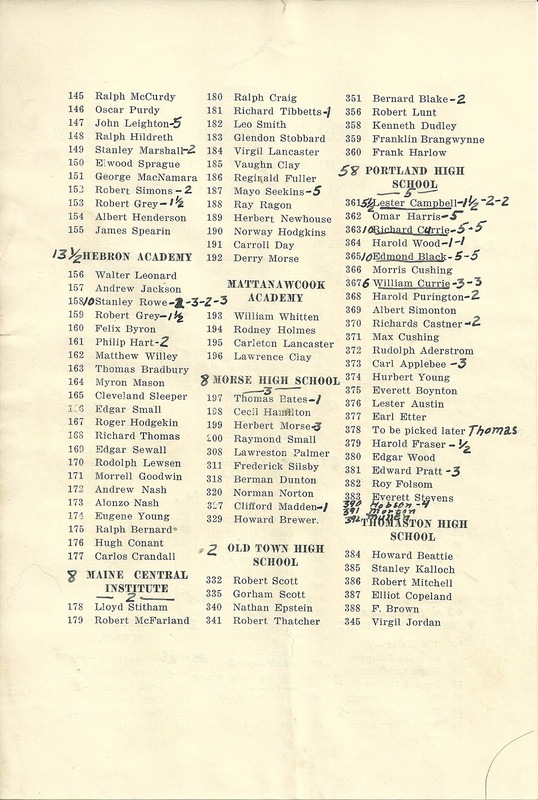 Besides the varsity team a Freshman team is picked as are also other class teams, interclass rces being held and numerals awarded. 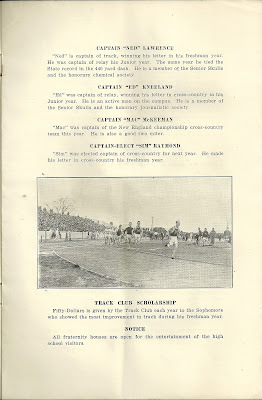 An inter-fraternity track meet is another feature of the winter months and is an outgrowth of relay. Relay is a coming sport at the University of Maine.